Tom’s article (below) speaks to why I believe 1967beetle.com has a been a successful effort. These cars have such a rich, emotional connection in people’s lives. Kudos to everyone that’s keeping these old gems on the road today. The people’s car is really about the people, and we had a grand assemblage of people over at my house for a “body-on” party. 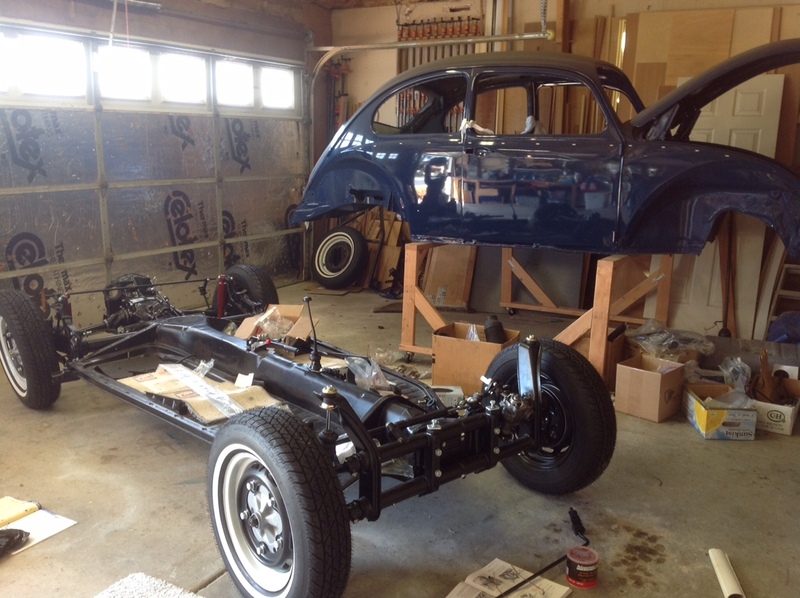 The ’67 Beetle that my daughter, Becca, and I are restoring, named “Bucky,” was finally going to get its body put back onto its chassis. I know, it’s about a 5-minute exercise, but it seemed a good reason to have a party. 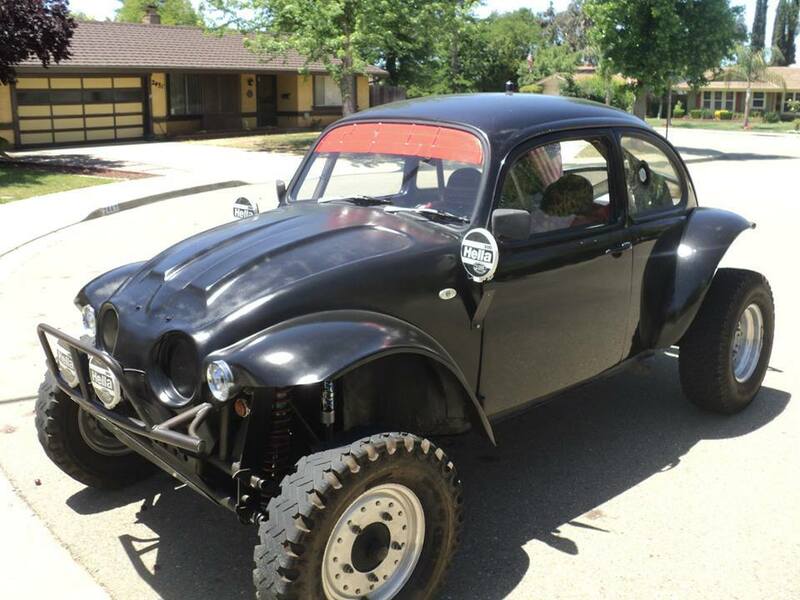 The evening got off on the right foot as Tony Mace, owner of Beetle Power in Pleasanton, showed up in his black Baja Bug. 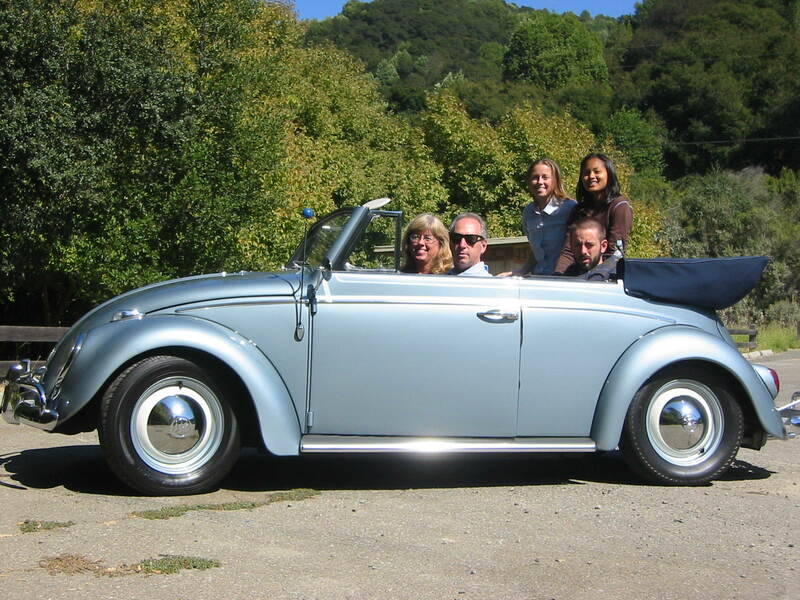 Then Joe Blackman, owner of Castro Valley Autohaus, and my buddy Matt Brown came driving up in Joe’s beautifully restored 1962 VW Beetle, both of them styling with the top down and arms resting on the doors as the sun sunk over the horizon. We had Italian antipasta and drinks in the garage and everyone was getting acquainted, or re-acquainted. Joe hadn’t seen Tony since the 1980’s when Tony was a young racer and mechanic working at his dad’s shop in Hayward. Joe and Tony are at opposite ends of the VW spectrum. Joe is refined and showroom detailed, and Tony is more effusive and horsepower-driven. They are both extremely knowledgeable about Volkswagen history, and both as honest as the day is long. Tony re-built Bucky’s engine from the ground up, and it’s a masterpiece. Joe seemed to take a certain pleasure in pointing out the most obscure deviations from original components (e.g. the clip that holds the fuse holder for the reverse lights is meant to be zinc plated, not painted), and I appreciated every nit-picky detail! There was one more honored guest, and he drove up in his modern Volkswagen station wagon (OK, who really cares what kind of car, if it isn’t a Beetle?). It was Dan Ferias, owner of Bob’s Custom Interiors, and, if you live in the SF Bay Area, he probably installed your headliner or your seat upholstery. The Buggy House, in Hayward, recommended Dan to install my headliner, and Dan also installed our good friend Eric Shoemaker’s headliner in his Savannah Beiege Bug. Jack Carver had just arrived back in town, and took special effort to be at the event. Jack used to have a “Herbie the Love Bug” 1967 Volkswagen that he would drive in parades and shows, as well as around town. Before we had too many glasses of wine or bottles of brew, it was time to move the body. With tapered alignment bolts in place,and the body gasket cleaned, we made sure to clear a path for the grunts who would be lifting and carrying the body (Matt Brown, Jim Capaccioli, Becca, and myself) and a small gathering of family and friends assembled to cheer us on. 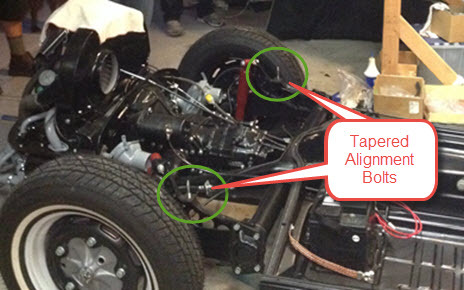 The wires that will connect to the reverse light connection at the front cone of the transmission were shoved into a heater port, and the doors were secured with old T-shirts. The actual moving of the body was fairly uneventful – except for one scary moment in which the top of the body nearly scraped against the metal arm of the garage door opener. Fortunately, lots of alert eyes in the peanut gallery saw it coming, and made us aware, so we were spared the sound of metal scratching beautifully painted metal. As the body nestled onto its old familiar location, we moved the party indoors for an incredible homemade Italian dinner, prepared by my incredible wife, and homemade tiramisu for dessert. 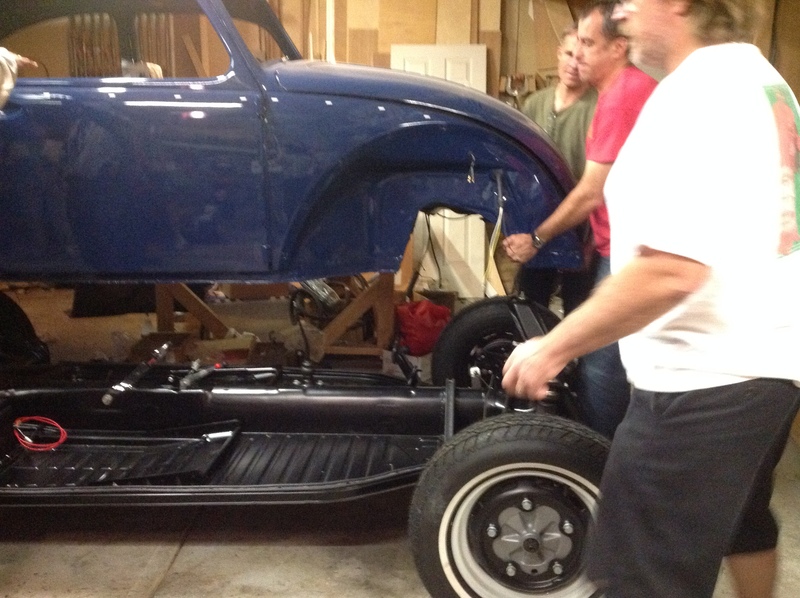 The guys gathered around telling old stories about cars (what else? ), and my 15-yr old daughter, Becca, got to understand more about the special bond we have with Volkswagens. 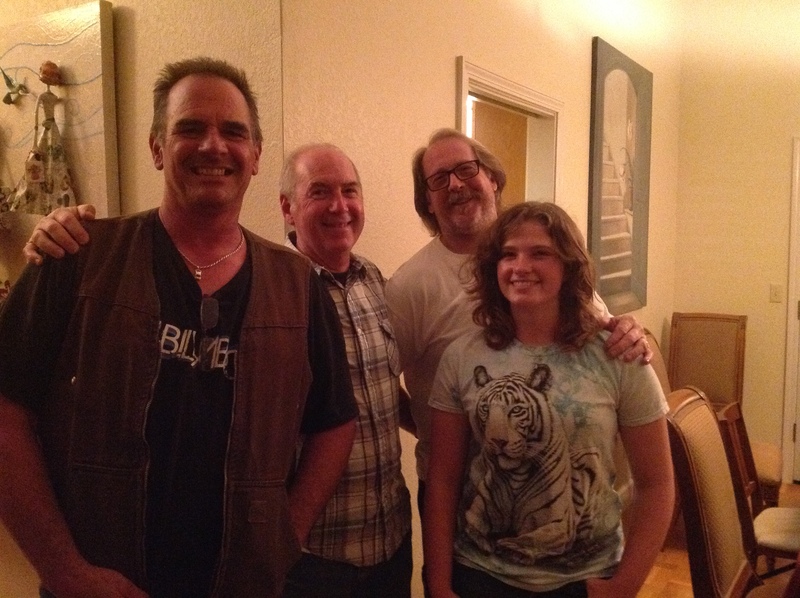 Dan Ferias, Joe Blackman, Tony Mace, and Becca Griffin. 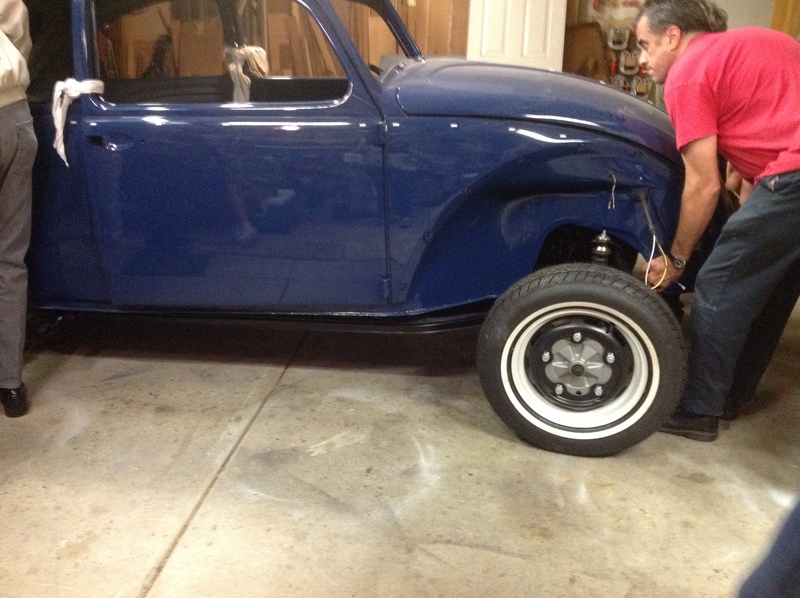 Thanks, Tom, for sharing your story again with 1967beetle.com. A great moment I’m sure. Thanks for sharing with us all. Good idea to make an event of this with not only good food, drinks, friends, but excellent documentation too to share with others! Of course all that expertise, in one area, had to be extra special! I agree! Kudos to Tom for a great story. Only thing I find wrong with this story is that I didn’t think of it FIRST! Great idea and, if the opportunity presents itself, I’m going to borrow it! Thanks for sharing. And Donna. We’re you not looking for a shop to tune your car in Edmonton area ?